Isarn in N.E. 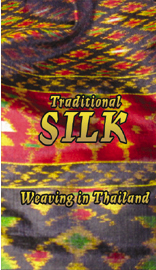 Thailand has been a cradle of silk worm rearing and silk weaving for thousands of years. 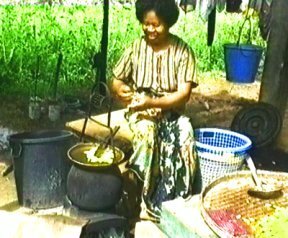 The processes are still carried on by families in village houses where silk worms are grown and fed on mulberry leaves and silk reeled in the traditional way. Silk sarongs and scarves of extraordinary quality with traditional designs and colours are hand-woven in weft ikat and supplementary weft techniques. Filmed in Isarn. Contents: rearing of silk worms and production of silk, tying and dyeing for weft ikat weaving and the unique heddle system for weaving complicated supplementary weft.